In which it's been a big week. What a wonderful, wild week at The Bookshelf! 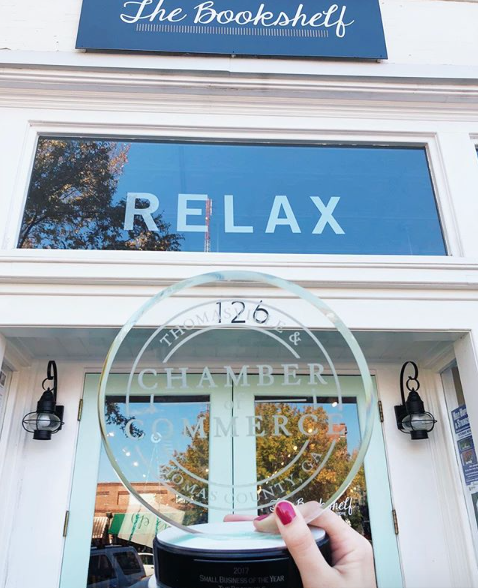 Last Thursday, your local indie bookstore was recognized as Small Business of the Year by the Thomasville-Thomas County Chamber of Commerce. We were nominated alongside some businesses we truly love and respect, including our very own upstairs neighbors at Everfan. Thank you to all who voted, to our friends and customers and fellow readers who remind us every day why we do what we do. We're so grateful! In other news, remember way back in August when we had to decorate our shop for the holidays, all in the name of Southern Living? Their feature on celebrating Christmas in Thomasville is now online and ready for your viewing pleasure! A bit about The Bookshelf is included, as well as spots on some of our favorite downtown friends, like Fuzzy Goat and The Paxton House. Read the article here, then stop by to see the feature in person when our copies of the magazine arrive! Here's what I want you to know: These accolades are special, and we're grateful for each and every review and mention The Bookshelf receives. When The Bookshelf gets noticed, that means Thomasville and the rest of our fantastic downtown gets noticed; we do what we do because of the town and the community we love. These past couple of weeks have had some serious "wins" for The Bookshelf, but my favorite moments still come from reading to your kids and recommending the next great book for your book club. Thank you for making The Bookshelf a place we love to work. We're so grateful. + Stories & Steeples at the Thomasville Visitors' Center - Friday, 11/10 at 5 p.m.
+ Book signing with author Mike Brown - Saturday, 11/18 from 2 to 4 p.m.
+ Holiday Open House and Wish List Party, featuring Polka Dot Press - Sunday, 11/19from 1 to 5 p.m.
PICTURE OF THE WEEK: This year's Soup Night was a resounding success! Each Bookshelf staffer made a different soup from Easy Soups from Scratch with Quick Breads to Match, a practical new cookbook we love. Kate walked away the winner of our friendly competition and the SOUPER CHEF crown (donated by our friends at Everfan, of course). This week on From the Front Porch, Chris and I recap what we read in October -- lots of thrillers, political memoirs, and, of course, John Green. Listen to full episodes on iTunes or through our new podcast website.